Cozy. Friendly. Delicious… that’s Toby’s Public House in Park Slope, Brooklyn. My good friend first introduced me to Toby’s when she had the pleasure of living just a stone’s throw from this awesome brick oven pizzeria and bar. Years later when she sadly left New York for DC, her goodbye dinner was at Toby’s. Now whenever she comes back to visit, a ceremonial stop to Toby’s is always on the itinerary. Every time I eat at Toby’s the food seems to gets better and better. On this recent trip, Toby’s was packed with happy patrons. We chose to eat at the bar to avoid an unusually long table wait caused by the NFL playoffs. This turned out to be an awesome decision thanks to the very nice bartender Mike, who doubled as our waiter. First we ordered a plate of Toby’s decadent mushroom ravioli. It was served straight from the brick oven in a seasoned cast iron pan and topped with a luscious creamy black truffle sauce. The dish was so good (and we were so hungry) that I didn’t take time to snap a pic. I know it’s hard to believe! Trust me, they looked and tasted fabulous and you should order them when you go! After the ravioli, we had a tough time choosing which pizza to order since every pie on the menu sounded amazing. My pick, and favorite, was the Proscuitto Di Parma with baby arugula, parmigiano reggiono, and olive oil. 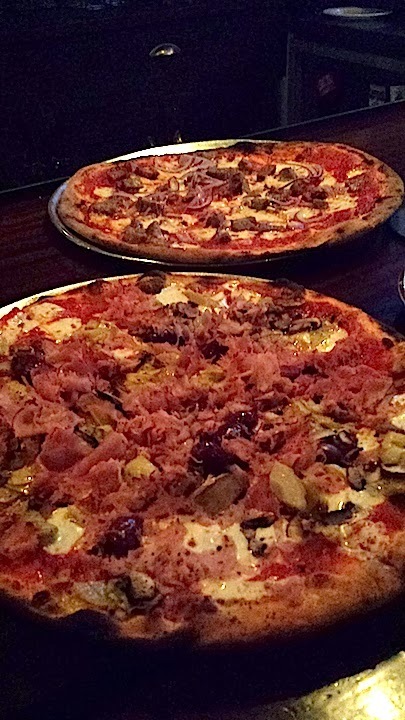 We also had the Del Mac with sweet italian sausage and red onions, and the Quattro Stagioni with parma cotto ham, crimini mushroom, artichoke hearts, and olives. All three thin crust pizzas were perfectly balanced and flavorful. 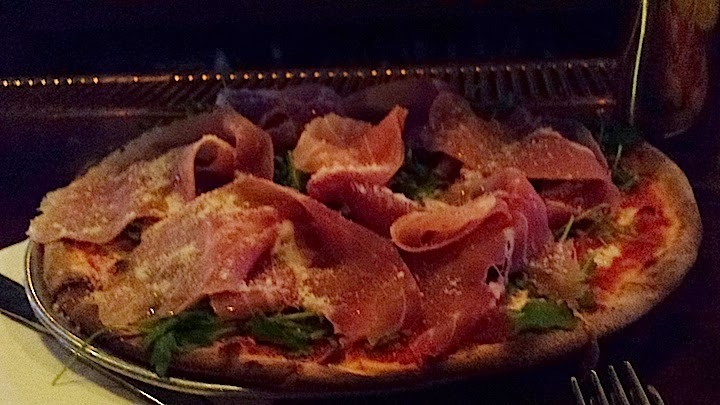 That was the first time that I remember actually having ham on pizza, and it was surprisingly tasty. 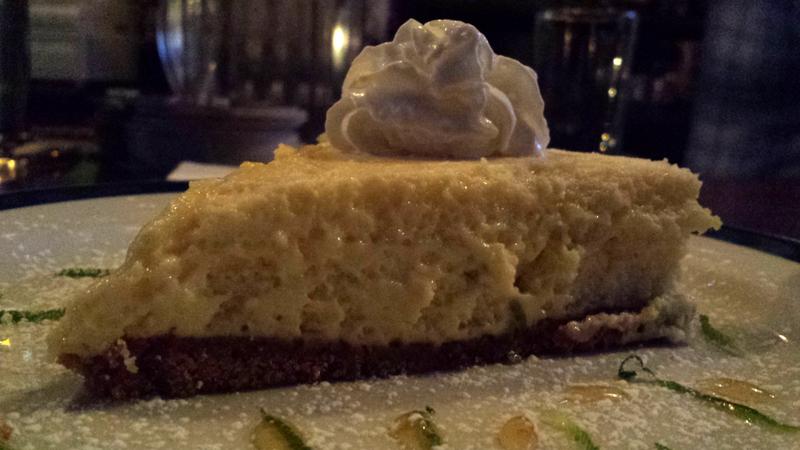 Since there is always room for dessert, I also shared a slice of light and fluffy key lime pie. A perfect end to a great meal. During my time at the bar I learned from Mike that Toby’s has a special beer club for discounts and specials. You even get your own mug that hangs above the bar. And if you can’t make it to Brooklyn, Toby’s has a second newer location in Little Italy. I’ve heard that the pizza there is equally as delicious, so I can’t wait to try it one day soon!